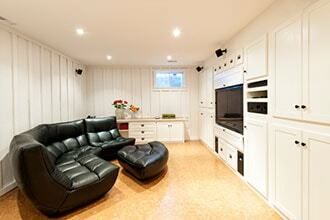 Basement remodeling is one of the most cost-effective ways to dramatically improve the value of your home. You already have a massive amount of under-utilized space that’s simply waiting to be transformed into useful, livable space. Whether it’s creating a family living space, extra bedrooms, adding a bathroom, or expanding the laundry room area, there are dozens of creative options to make use of your basement. The first step in transforming that old, humid, under-used basement into a space you’ll love is working with a residential remodeling contractor that knows how to turn your ideas into reality. At Magazi-AG, we’ve spend more than a quarter century in basement remodeling, and we know what it takes to get the job done efficiently. When remodeling a basement, the moisture and climate problem is usually one of the first problems to tackle. Basements are typically the coldest, most humid area of your home. What this means is the prettiest remodeling project will be wasted if the basement isn’t properly sealed. Mold, mildew, warping walls, failing drywall, and a range of other problems can occur if you choose a basement remodeling contractor that doesn’t know how to handle the climate issue correctly. Working around the existing infrastructure, such as plumbing and ductwork is another challenge that an experienced residential remodeling contractor will know how to tackle. Low light is another typical problem that many basements face. 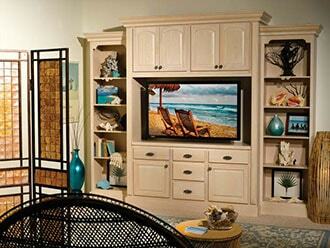 This can be overcome with intelligent planning and the installation of built-in light fixtures. 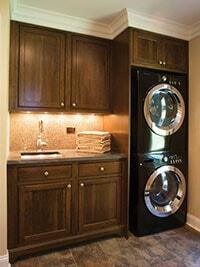 The laundry room may not be your favorite room in the house, but it’s one that certainly receives a lot of use. With a smart remodel, we can create a laundry room that will make doing laundry a pleasant experience in a wide-open space that’s designed for practicality. Let us meet with you to discuss your needs for a laundry room and suggest creative designs that will make intelligent use of your existing space. Homeowners throughout Montgomery, Howard, Baltimore, and Anne Arundel Counties, including the towns of Bethesda, Silver Spring, Rockville, Chevy Chase, Ellicott City, Columbia, Severna Park, Olney, Gaithersburg, Kensington, and more, choose Magazi-AG for their basement remodel. The first step in your basement remodel begins with your free consultation, which can take place in your home or in our showroom. We’ll meet with you to discuss your vision for the basement, and give you honest advice based on 25-plus years of basement remodeling. Call us at 301-913-0286 or contact us today to get started.